I was recently talking with a friend of mine who is a vegan. Weird way to start out a post about meat, huh? We were discussing his reasons for not consuming meat, all of which I admire and respect, and I was able to share with him why I choose to raise animals for food. The fact is that, as a society, we’re not going to stop eating meat, dairy, and eggs. However, I firmly believe that we can consume these foods in a more responsible and humane manner. Part of being able to do so is looking for and supporting the folks in our communities who are making this a possibility. I made the decision early on that on-farm harvesting was non-negotiable. Packing animals in a trailer who have never set foot off the farm is stressful, for both them and me. The added stress of sitting in a holding pen for hours on end and even the possibility of someone mistreating them is not in their best interest. I spend months raising hogs and years raising beef and out of respect for them and what they provide to my family and many others, I want to personally see to it that they are harvested with the same consideration. Back in February, Andrew Turner from Turner Custom Harvest Solutions, LLC. came out to the farm to harvest a few of our animals. He’s been out many times before and I am always in awe of how calm and easy-going he is when interacting with the animals. I still remember the time two of my hogs escaped the small area I had them in and as I watched head out to graze in a large, open pasture area. He said…”Just let’em go”. No stress, no chasing them around and yelling. Andrew Turner - Turner Custom Harvest Solutions, LLC. 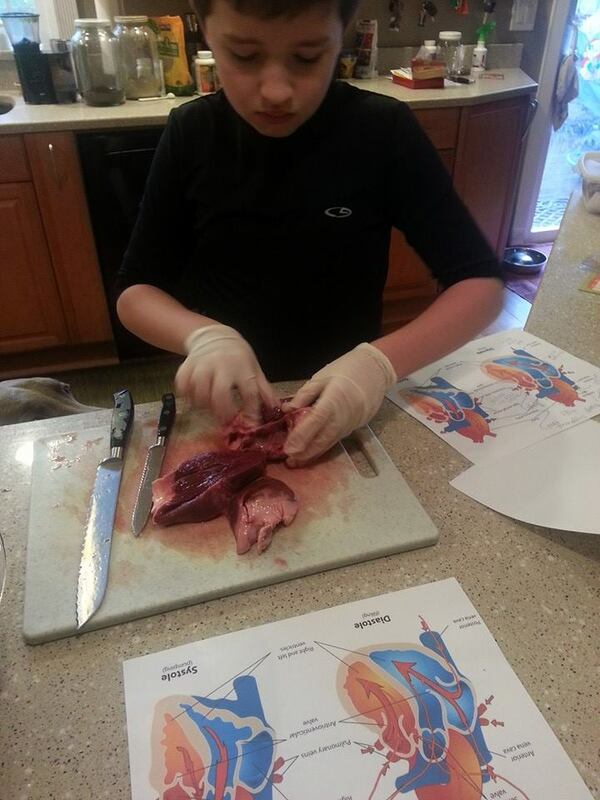 He also provided a brief lesson on the reproductive system of a female hog after many failed attempts to breed her and made sure that Cameron had the beef heart he wanted to dissect for his homeschool science project. Time is money in the mobile slaughtering business and when someone takes their time to go the extra mile to make sure my animals aren’t under stress or my kiddo can learn something, that really says a lot. As I watched Andrew and his apprentice work, it really hit me that, without folks like them, there would be no farm fresh, pastured meats from Phillips Family Farm to fill our customer’s freezers. I really wanted to get to know more about what the other side of the process looks like. Side note: I use the word “Harvest” a lot when talking about our pastured meats but, in reality, Andrew is a “Mobile Slaughterman”. Harvesting sounds so much softer and gentler to folks who aren’t used to being face to face with raising animals for food but I think sometimes you just have to say it like it is. A lot of what has allowed factory farming to continue is that there’s an element of not REALLY wanting to know where our food comes from. I think as educated consumers, we need to get past this and even go a little deeper. I asked Andrew if it would ever be possible to tour the custom cutting facility of The Meating Place, one of the local butcher shops he delivers to, and it just so happened that he was preparing to cut and wrap beef for himself. The timing was perfect! Andrew is also a butcher, meaning, in addition to mobile slaughtering, preparing the carcass and transporting it to the actual butcher shop, he also is well skilled in the art of breaking down a side of beef, pork, lamb, etc... and cutting into roasts, steaks, chops and other cuts that you and I would recognize. I use the word “art”, because as I learned, it truly is an art form and that requires skill and a great deal of training. As Andrew brought out the side of beef he was preparing to work on, he began pointing out the various parts. “This is where the tri-top comes from….” I felt like it was my first day of Anatomy & Physiology class, where I could pick out the bony landmarks, but I just couldn’t see it the same way a trained professional could. As he began to work, the meat started to take shape. It’s a time-consuming process that if done quickly or carelessly, results in more waste or more ground meat than you had probably hoped for. I learned that the challenges Andrew faces are a lot like my own. It’s long days, in all weather conditions, dangerous situations with animals and tools, and very physically demanding. There can also be some folks who stand in judgment of what we do. That somehow a person who raises or slaughters animals for food isn’t compassionate or somehow this a reflection of some sort of character flaw. I couldn’t disagree more considering what I know of factory farms. What you DON’T see is a whole lot worse than what you DO see. I also think there’s a misconception that folks who farm or are in farm-related fields are engaged in a manual labor type occupation because they aren’t as intelligent as those in the corporate world. I have met many people throughout my years of farming and can tell you that, hands down, you will never find folks who are more resilient, resourceful and intelligent. They can literally make something from nothing and make the best of any challenge they are presented with. The rewards are similar as well. The connection to customers, the outdoors, the animals, always learning and honing your craft. It’s back-breaking work but it’s fulfilling, something I personally never found sitting behind a desk. Andrew enjoys his work and it really shows. I am beyond grateful to partner with folks like Andrew from Turner Custom Harvest Solutions, LLC and The Meating Place to bring my family and YOUR FAMILY the very best possible pasture-raised meats. I’d love to continue the conversation and hear what thoughts or questions this brings up for you in the comments below.